The ball is served, breath is held and we watch as the volleyball flies over the net to see if the opposing team can return it or will it hit the ground in their court. Fast paced and the leaderboard changes often. Volleyball is an exciting sport filled with aces, spikes and lots of dives for the ball. 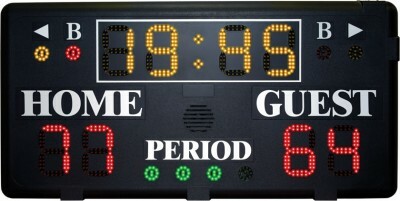 Using your scoreboard you can keep up with the time in the game, the score and who has the latest fouls. 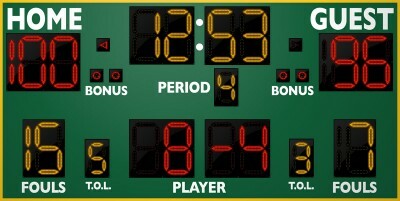 Basic boards offer simple statistics while the more advanced boards also include possession, bonuses, fouls and player numbers and periods. You can also customize your scoreboard with logos, sponsor panels, wireless controls and more! 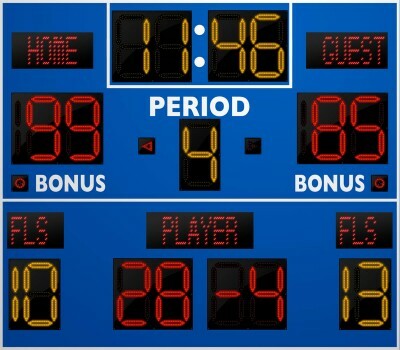 A deluxe tabletop scoreboard for serious indoor programs, the LED-4 scores basketball, wrestling, volleyball and most other indoor sports. 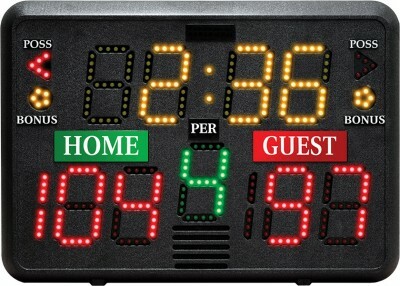 22" x 15" x 8"
This top-selling wall-mounted scoreboard is perfect for organizations who need to keep their expenditures under control! 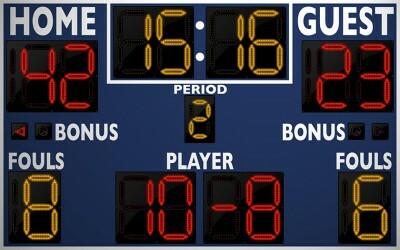 4' x 2' x 4"
This outdoor version of our top-selling wall-mounted scoreboard is perfect for organizations on a budget who still require portability. Limited vertical space? Not a problem with the space-saving 2234! 6'6" x 3' x 4"
Can a small program find the perfect scoreboard? We think so, and the 2236 just might make you agree. The 2236 incorporates big-league function into a compact cabinet at an absolutely unbeatable price! 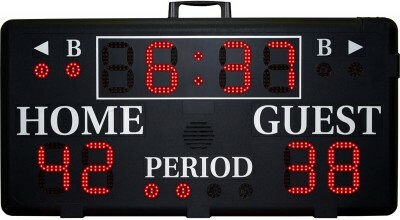 8' x 3' x 8"
Lead your team with this indoor scoreboard! Large 15" LED digits have a wide viewing angle and are legible from over 300 feet away! 8' x 4' x 8"
Designed for multiple sport applications, the 2246 is an all-around champion. 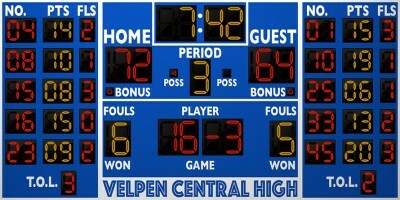 8' x 5' x 8"
Lead your team with this outdoor scoreboard! Large 15" LED digits have a wide viewing angle and are legible from over 300 feet away! 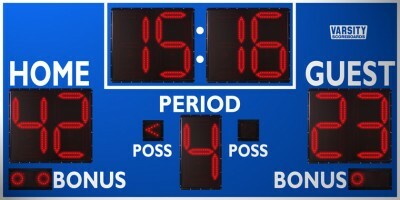 8' x 7' x 8"
Deluxe basketball scoreboard! Large 15" LED digits have a wide viewing angle and are legible from over 300 feet away. Also includes 5-player PPF panels with Time Outs Left! 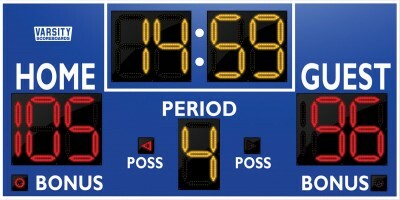 16' x 8' x 8"
Deluxe basketball scoreboard! Large 15" LED digits have a wide viewing angle and are legible from over 300 feet away. Also includes 6-player PPF panels! 18' x 8' x 8"
Our widest and most comprehensive basketball scoreboard is perfect for your medium- to large-sized basketball program! 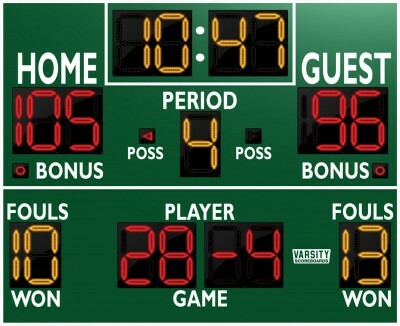 10' x 5' x 8"
This cutting-edge basketball scoreboard features all vital game information PLUS programmable electronic captions!